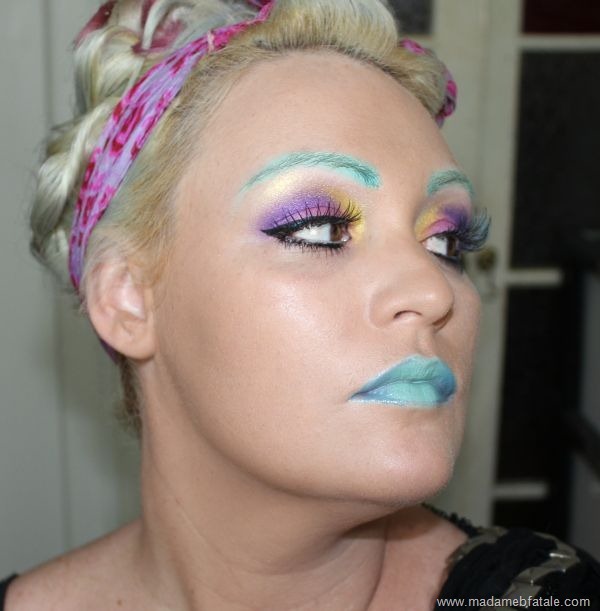 Madame B FataleAlmost Neon Makeup Tutorial- photo’s, products, tutorial & more! Almost Neon Makeup Tutorial- photo’s, products, tutorial & more! Back with another super bright almost neon look for you all today! 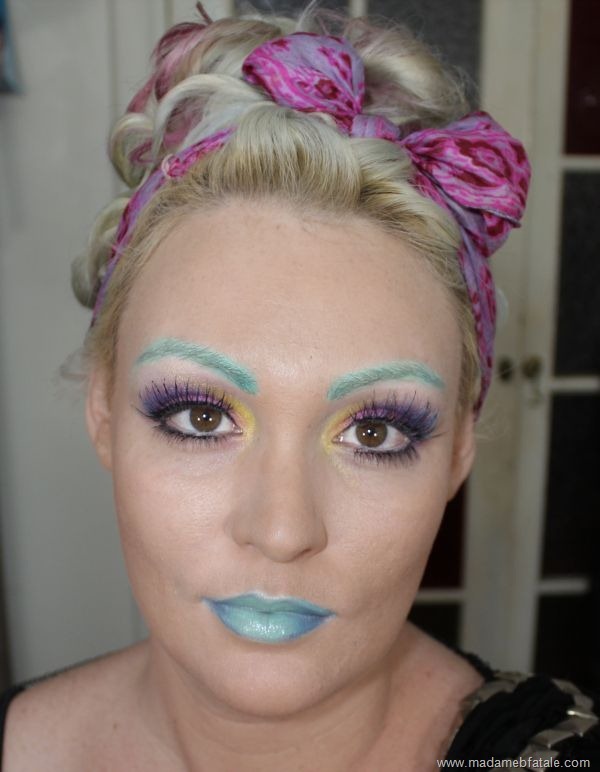 Makeupnet sent me a couple of new Limecrime products (they are the distributors for the brand in Australia now) to play around with and I kind of felt the need to go all out. Partly because I’ve been catching up on RuPaul’s Drag Race (love it!) and partly because I know that Mint to be Lipstick isn’t going to be for everyone. In my mind if you are brave enough to wear this lovely shade on your lips your also probably confident enough to pull off the rest of the look too. 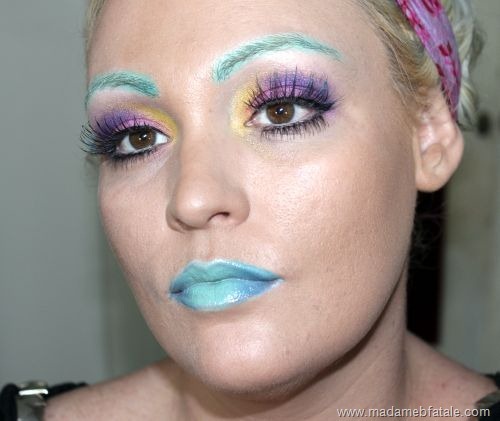 Plus I just love bright makeup! But I have to say this is one of those looks that you can take one feature and leave the rest kind of ‘blank’ if you aren’t feeling so daring. Covergirl & Olay Simply Ageless Foundation (do not understand why people don’t like this, I love the finish it gives! ), Illamasqua Disobey as contour (I use this all the time), Mac Mineralise Skinfinish in Soft & Gentle. 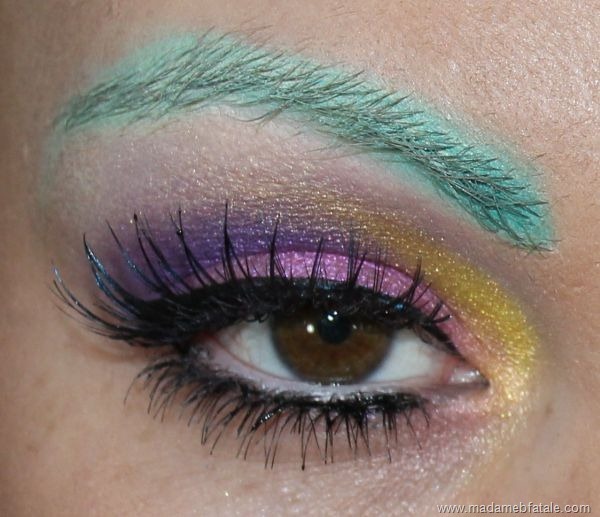 Limecrime Magic Eye Dusts in Pink Poodle, Circus Girl, Royal Purple (not telling the name till the comps over! ), Nymph and Troubadour. White eyeliner pencil (not sure which one I picked up, sorry! Now onto the fun part, the video. In the video I mention that you can win the mystery royal purple shadow, all you have to do is go to Makeupnet and find it in the Limecrime eye shadow section, go back to the video and comment the name of the colour! Its that simple. Australian subscribers only and it ends 19th March 2012. Winners will be selected randomly from the correct answers! Would you wear this, or any ‘parts’? Disclosure- Makeupnet sent me some products for the look but I’m not being compensated and I wouldn’t feature them if I didn’t like to wear them myself! haha, yep definitely not for everyone! Wow, you look like a beautiful porcelain doll! I love this. I’d definitely wear the eye makeup in a heartbeat. I love that the brows match the lips. Wow, your eyes are beautiful!